Tony's Talking Pictures Blog: New in Theaters for July 7th, 2017 "Spider-Man: Homecoming"
New in Theaters for July 7th, 2017 "Spider-Man: Homecoming"
Starring: Tom Holland and Robert Downey Jr.
“Spider-Man: Homecoming” is not just another 'origin' story rehashing how the web-slinger began his career as your friendly neighborhood Spider-Man. This a more of a coming of age story about a young man moving from his awkward teenage years into adulthood and taking responsibility for himself and the things most important to him. Tom Holland is well cast as the boy on the brink of manhood who is coming to terms with his powers. 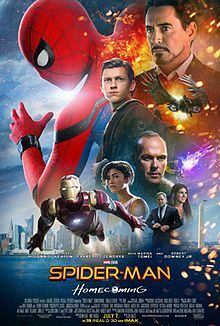 Holland's Peter Parker is a wide-eyed innocent trying to help and stumbling over his own feet all the while longing for the day he will become something greater than the some his parts. “Spider-Man: Homecoming” is an engaging and action-packed summer blockbuster, but offers more than explosions and special effects. There's a deep insight into the inner workings of a superhero.